The Serious Sales team love nothing better than catching up with chefs and buyers from all over the UK food industry network, and at Hotelympia we were showcasing some exciting new products from four of our favourite European food partners: Surgital Pasta, Gourmand pastries, Amore di Gelato Ice-cream and Dots Original Doughnuts. We welcomed Paul Cancellari and Chef Anacleto Cavina from Surgital Pasta, who stopped everyone in their tracks at the show with delicious samples of filled and plain fresh pasta combined with some of the best, fresh-frozen ready-made pasta sauces on the market. These guys are based in the Emilia Romagna region of Northeast Italy where pasta is in their DNA and Surgital is widely recognised as the No.1 food service pasta manufacturers in their home country. We love their products and we’re really proud to be working with them. Viennoiserie specialists Gourmand travelled over from Belgium to launch their brand new pastry concepts on the Serious Food counter at Hotelympia. Their man-in-the-UK James Whiteside introduced a knock-out range of three new savoury pastries: Goats Cheese and Fig Jam, Spinach and Ricotta, and Aged Gouda Cheese. James introduced Gourmand’s new sweet Danish Blueberry and Custard Plait, and an Italian-inspired Croissant Reale with orange and lemon incorporated into crisp, fine layers of dough, and pretty crystals of rock sugar on the top. Gourmand have recently introduced a clever new mixed box collection of mid-sized pastries: Apricot, Almond and Praline, which are an ideal break-out solution for our hotel and conference partners. The team at Gourmand have also been hard at work creating a delicious, affordable alternative to the traditional all-butter croissant. We think their ingenious Super-Blend croissant is a winner. Promising to deliver great margins to our customers without compromising on flavour or quality. If you don’t believe us… get in touch and we’ll send you some free samples to prove it! 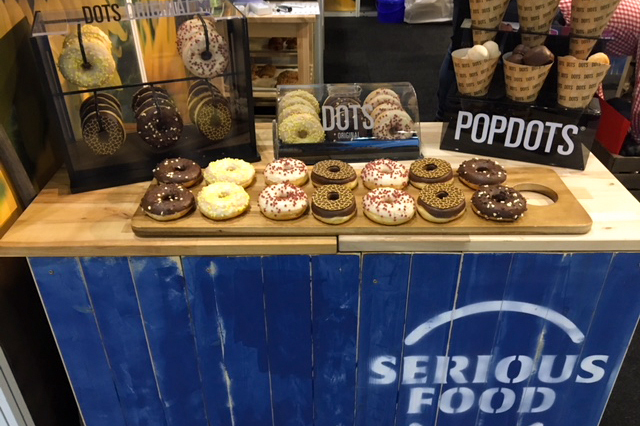 Our Spanish friends from Dots Original Doughnuts have created an instantly recognisable, eye-catching doughnut brand which is really taking off with our food service customers in the UK. We enjoyed making some serious noise about these guys at Hotelympia because they always deliver winning products and a brilliant service to match. Dots Doughnuts look totally mouth-watering, and because they are proved for 50% longer than most, they have a delicious light and fluffy texture. Dots Doughnuts are a food operators dream solution for a grab-and-go sweet treat. Eyecatching yet practical point-of-sale and branded packaging can be supplied as part of the Dots Original kit. Give us a call if you’d like to know more.